There is a vignette in one of our guidebooks that tells of how Erasmus killed a Hapsburg prince in a duel and then hid out at Predjama, a small castle in the Slovenian countryside, from whence he launched raider attacks on the local nobility while the emperor’s army laid siege to his fortress in vain. Though the time period fit, this was a difficult image to square with the Dutch humanist who is now the namesake of one of the better known student exchange programs in the world. We did some fact-checking (i.e. Wikipedia) and it seems that while the author of our guidebook got the name wrong — the robber baron was actually named Erazem Lueger — the legend of his escapades is very much based in real-life events. We visited the famed castle on our last day in Slovenia before going for a tour of the nearby Postojna caves. Predjama translates literally to “in front of the cave,” and it’s easy to see how this fortress proved impregnable in the 15th century. 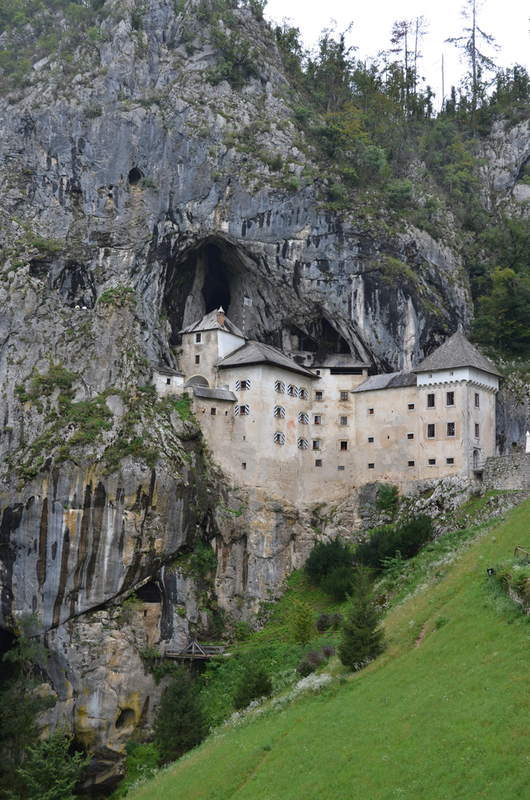 Unlike Slovenia’s other castles, which tend to be perched atop cliffs and are visible for miles, Predjama crouches inside the mouth of a massive limestone cave. It was entirely hidden from us as we approached it, all of a sudden bursting into view as we rounded the last bend in the road. According to legend, Erazem not only withstood a year-long siege of Predjama but also openly mocked his attackers by showering them with fresh cherries. Unbeknownst to the Hapsburg army that had been sent to starve him into submission, a secret tunnel led from the castle through the cave and out to nearby Vipava. This allowed Erazem not only to maintain his stock of supplies but also to continue his plunder of the Hapsburg estates. Alas, the emperor’s army had the last laugh. One of Erazem’s servants was bribed into betraying him by placing a small signal flag when the rebel knight went to the toilet. The outhouse was situated in an exposed corner of the castle’s top floor and proved an easy target for the Hapsburg cannons. We did not actually enter the castle. Both of our guidebooks cautioned against paying for the pricey tour, and our previous experiences visiting castles suggested that the exterior would be far more interesting than the restored interior anyway. In addition to touring the castle itself, it is possible to visit the caverns that run beneath it, but we skipped those too. 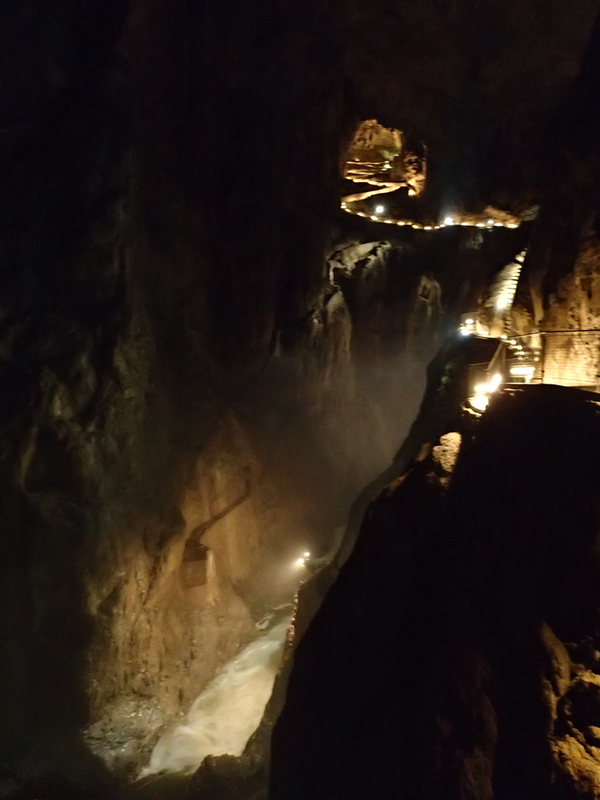 We had toured the Škocjan caves the previous day and planned to end our trip around Slovenia with a visit to Postojna, meaning we were already courting cavern overkill. 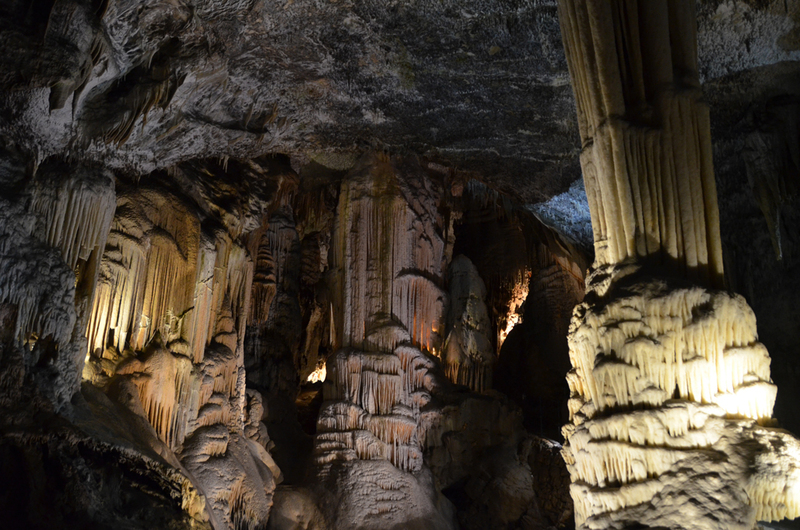 Although the Škocjan caves play second fiddle to Postojna, they are magnificent in their own right. 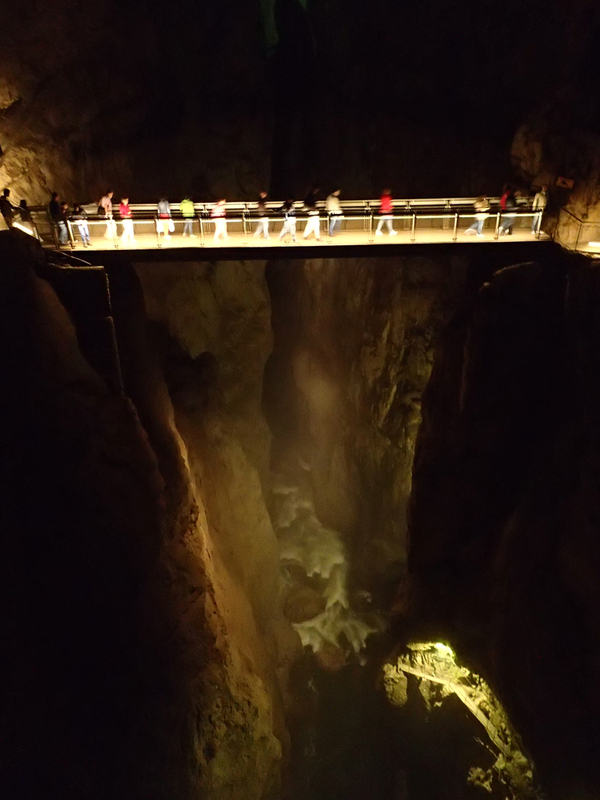 A rumbling underground river, 100-meter high walls, and a narrow bridge spanning over the abyss evoke the ambiance of countless adventure tales, from Tolkien and Jules Verne to Batman and Indiana Jones. Škocjan offers a good mix of grandeur and nature’s fancy. 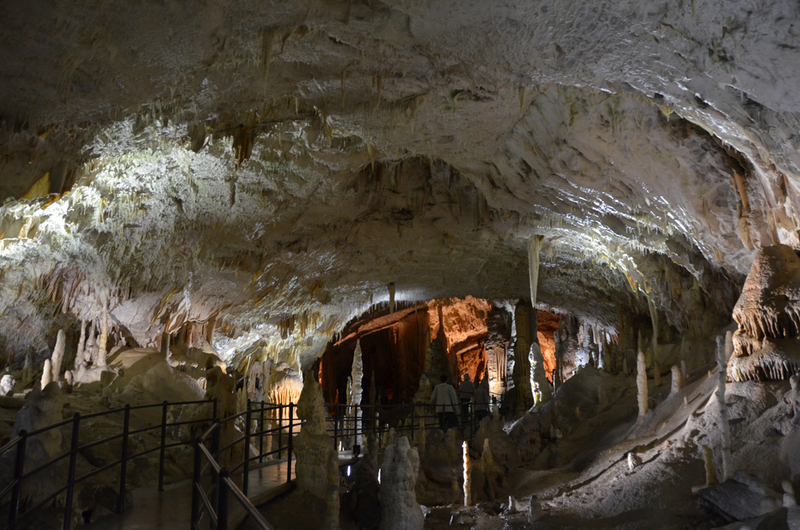 The Silent Cave, where the tour starts, is embellished with stalactites and stalagmites while the Murmuring Cave’s dizzying depth is amplified by the fast-flowing Reka River, which starts aboveground before plunging through a sinkhole to carve its pathway through Škocjan’s limestone walls. The only killjoy is the organized tour, which is a requisite if one wants to set foot inside Škocjan. 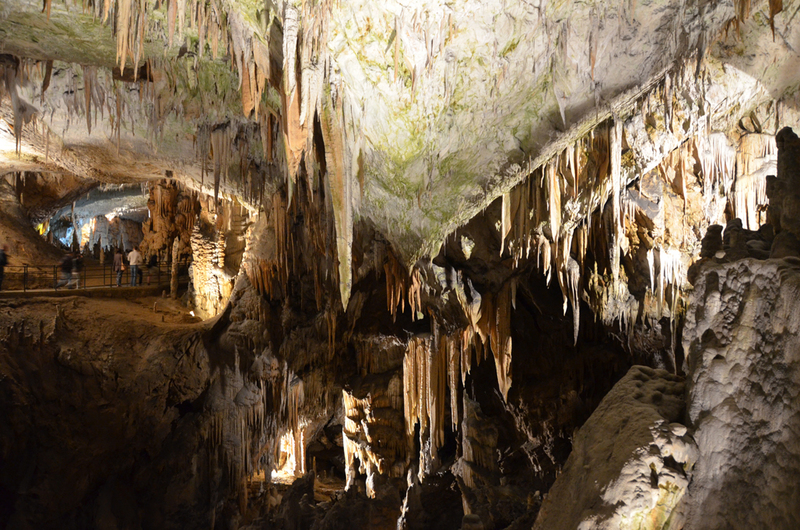 It takes close to two hours to walk through the caves, the tour punctuated by periodic stops during which the guide shouts uninformative explanations about the caverns’ history. 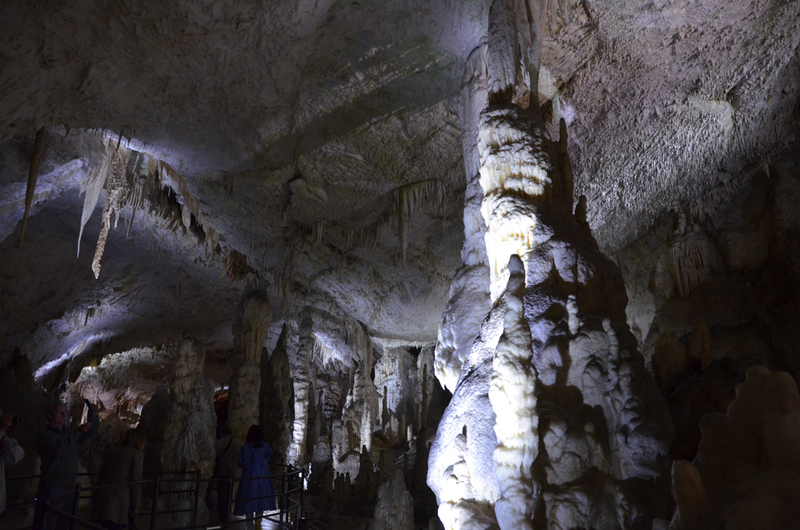 What irked us most is the prohibition of photography inside the caves, which the guide justified with a garbled explanation about the caves being a protected space. While banning flash photography, as Postojna does, makes perfect sense to help protect the mineral deposits from discoloration, it’s hard to conceive what damage can be done by photos taken on a digital camera without flash. To ensure that guests did not linger and surreptitiously take photos, the guide would gather the group and turn off the lights in each section before proceeding onward. We had thought the entrance fee for Škocjan was a little on the steep side, but that was before we saw the Disney-like atmosphere and ticket prices at Postojna. Part of it was sticker shock; we paid 50 euros for the two of us plus Munchkin’s infant ticket “so that he would be insured while inside the caves.” It wasn’t the cost, however, that ate at us; it was the feeling of being nickel-and-dimed. 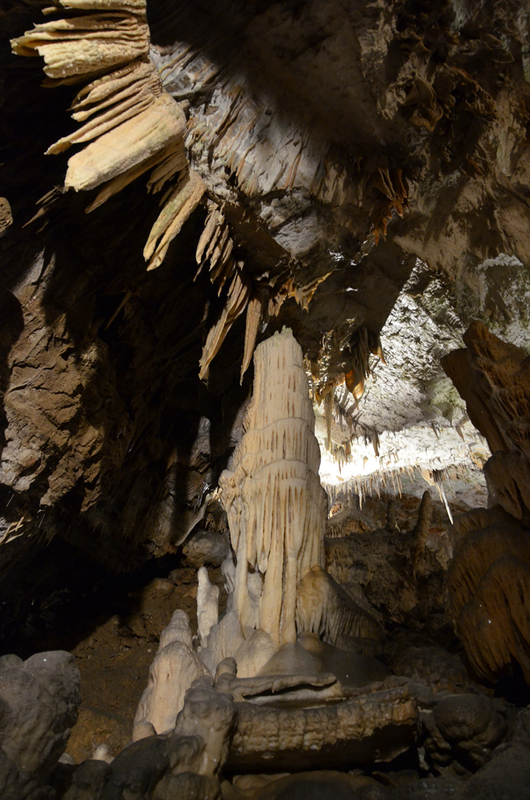 The cave entrance is located outside the population center for Postojna. Due to the caves’ popularity, there is a sizable parking lot that abuts the tourist mega complex at the entrance — it is the only place to park if one is visiting the caves, and yet, parking is not included in the price of admission. Worse still, to add insult to injury, one can park for free for the first 30 minutes. Similar to Škocjan, the tour lasts close to two hours, so the only people who do not pay for parking are the ones who leave after deciding that the caves are not worth the price of admission. And yet, annoyed though we were by the situation, the negative feelings dissipated as soon as we set foot underground. Postojna’s beauty, matched only by its immensity, is difficult to convey in words. 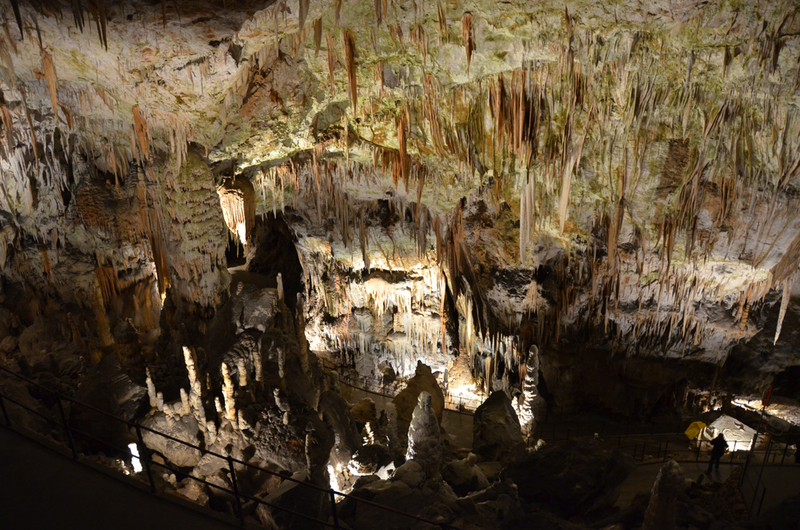 For that matter, pictures also fail to do the caves justice. There are over 20 kilometers of labyrinthine passages through which one can walk, but that’s not all. To access them, one must first get on a train. Five kilometers of underground train tracks connect the entrance with the remote and ornate inner chambers of the caverns. We were glad we brought some warm layers. The temperature underground is a steady 9°C but it felt a lot colder during our ten-minute ride, as the open-air train cars whipped up a steady gust of wind. We passed through a high-domed vault that had been illuminated with chandeliers, and sped by countless stalactites and stalagmites. Our mouths were agape with wonderment even before we started the walking tour. 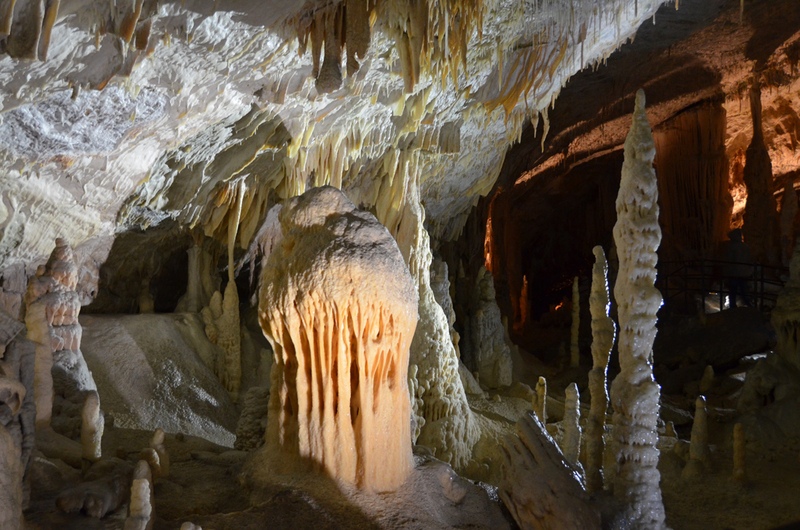 Flash photography is forbidden but, to their credit, the keepers of Postojna set up the lighting system so that it would complement and highlight nature’s more outlandish creations. Mounds of mineral deposits dripped like multi-colored molten wax, and somehow each chamber seemed to contain wildly different accretions, from the thin, icicle-shaped stalactites in the so-called Spaghetti Room to the thick pillars shooting out of the floor that had taken millennia to accumulate.